Author's Note: Fun story. I hung out at the show Sunday during the public day and looked around at all the neat stuff beyond the cars themselves More to see when fewer people were there. 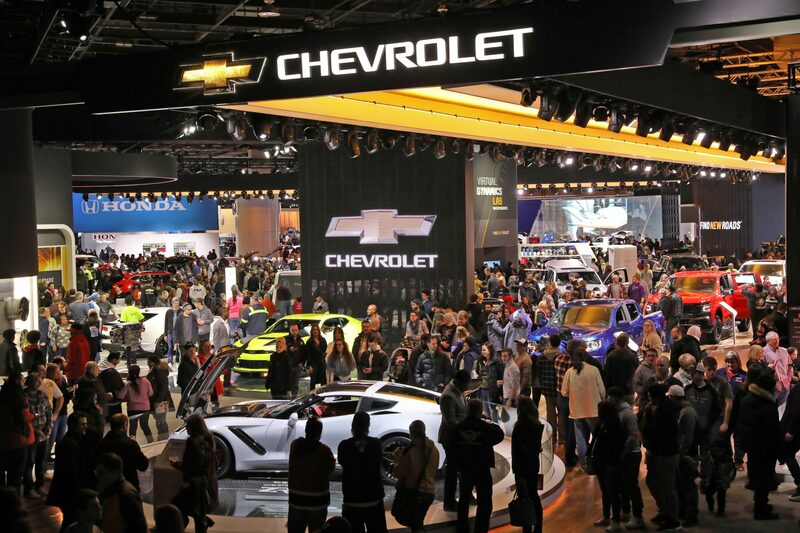 Auto shows are often a pilgrimage for the masses to worship the four wheeled wonders. People drive down in their old faithful vehicle, a few dents, a lot of miles and even more memories, to see the latest offerings, the Holy Grail of Detroit. 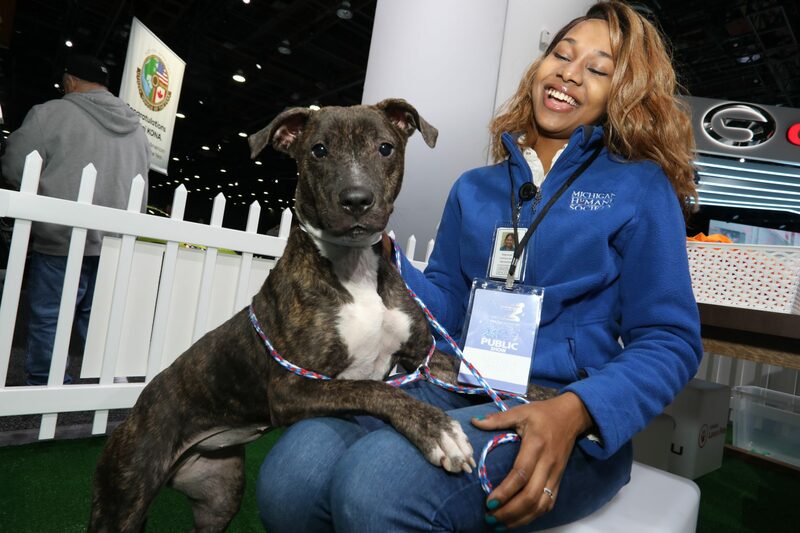 Up to 800,000 people come to kick tires, play trivia, even adopt a pet. Some people complained the North American International Auto Show in Detroit was smaller with fewer vehicle lines represented than previous years. On this, the 30th anniversary of NAIAS I’d say the added space is a gift to attendees and exhibitors. More space meant larger, more creative exhibits and room for padded benches in almost every booth where you could wait, take in a show with a product specialist, charge your cell phone and watch kids play with Legos or crawling up a truck bed in the exhibit halls of Cobo Center. 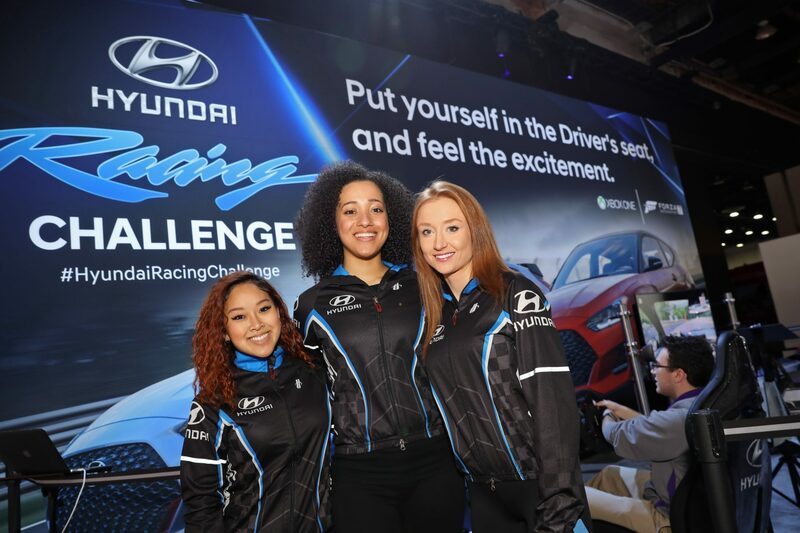 For the video game generation, automakers provided large, virtual reality stations, from Chevrolet to Fiat Chrysler Automotive to Denso, an automotive supplier. 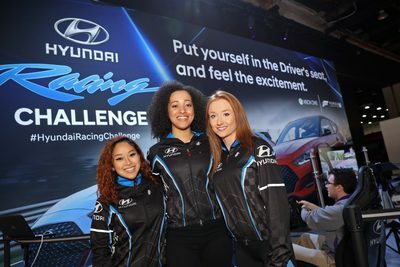 People could see the future of autonomous cars, the precision of new braking systems, the promise of hydrogen power or view an entire product lineup without leaving a chair. My favorite was the Bob Bondurant Dodge Challenger equipped with a Hellcat V8 with 707 horsepower and 650-foot pounds of torque. 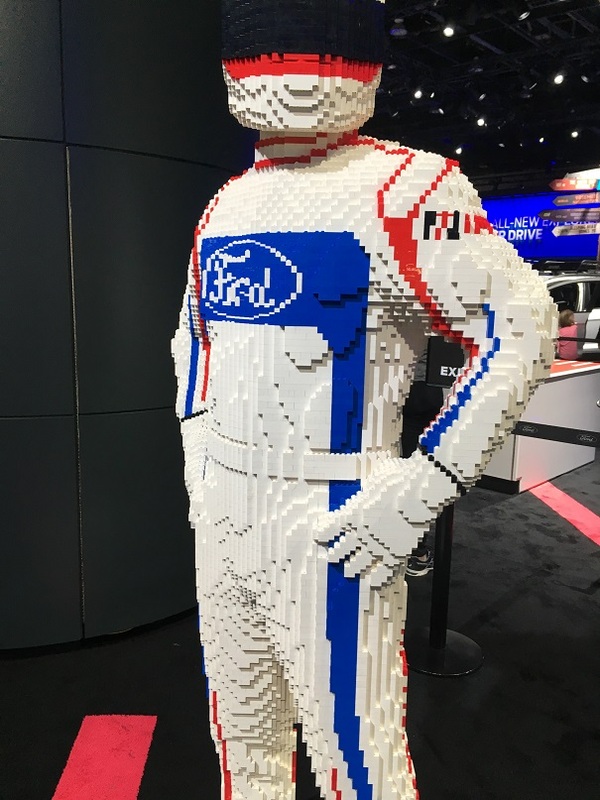 Visitor could sit in the car and roar through the paces of a virtual race track while the vehicle appeared to travel so fast the cement floor actually shook underneath. People walked out of the car with their knees wobbling. Fast is an understatement. They could visit the DodgeGarage.com and learn more about FCA’s fleet of performance vehicles. Need a break? The absence of German automakers Porsche, Mercedes Benz and Maybach, not to mention no Jaguar or Mazda, meant enough space for a food court in the back of the hall. 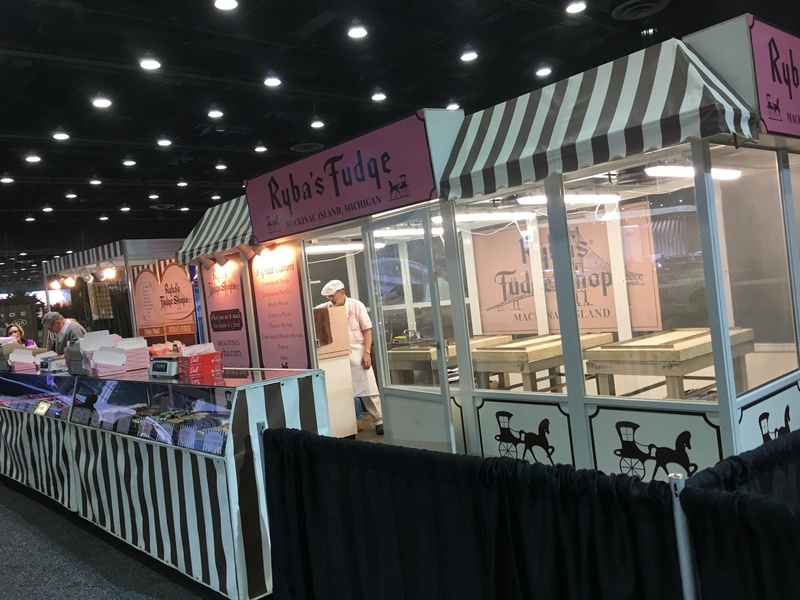 You could get the usual roasted almonds and Ryba Fudge, along with mac and cheese, hamburgers and other options. A little boutique sold stuffed animals, t-shirts and memorabilia from the show. 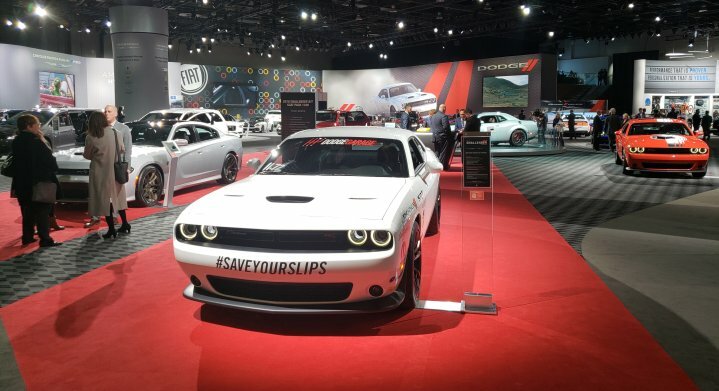 The exhibiting automakers made sure that nearly all the vehicles – save the finest sports cars and concept vehicles – had open doors, hatches and trunk lids. 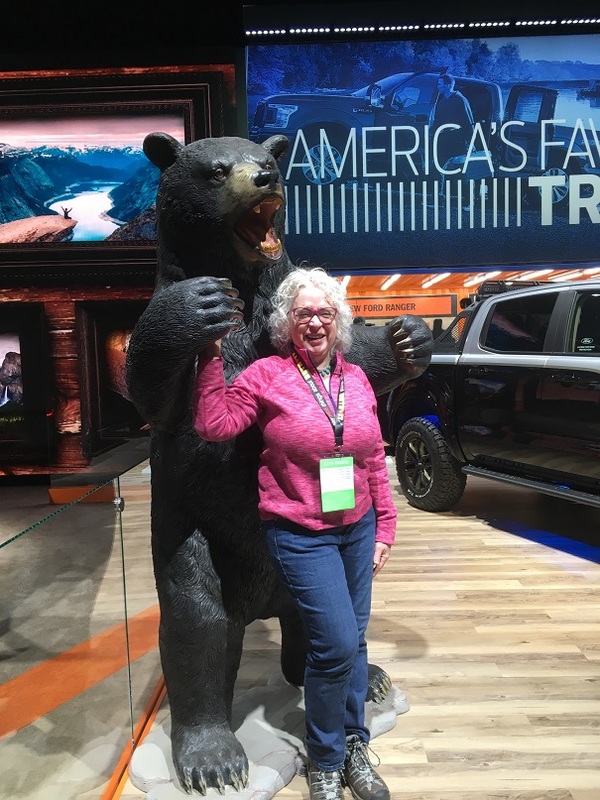 People jumped in and out of vehicles, took notes about comparative products and asked product specialists to discern the difference between a Toyota Tacoma and a Ford F150. 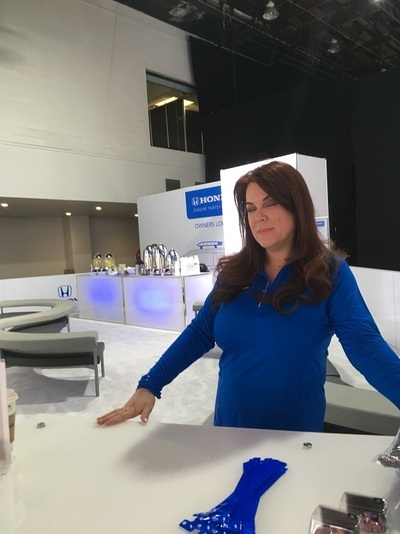 Comparison shopping without the pressure of buying, is one of the chief advantages of the show according to Toyota product specialist Christina Helena. 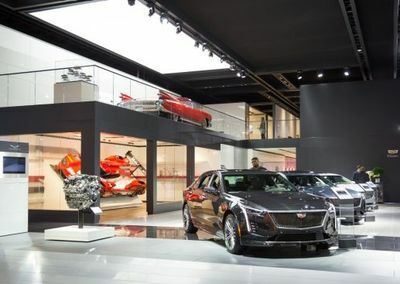 Cadillac’s booth was built from the ground up this year according to Kevin Calabrese, the vice president of creative services for Czarnowski, the exhibit builder for General Motors. “We’ve got plenty of eye candy and superior sound,” he said when we chatted by the coffee shop. On the main floor Cadillac debuted its XTS and showcased the XT4 among its vehicles. Upstairs car lovers found the 1959 Biarritz convertible in candy apple red with tail fins more than a foot long. Auto handlers with brushes had to remove the drool often. Just around the corner Chevrolet had no less than four screens, each as large as a Hollywood mansion, all extolling the lifestyle Silverado truck users would enjoy. Every hour on the hour a live product specialist would give a presentation on the merits. If children got bored, they could run over to the Silverado 1500 LT Trail boss made entirely of Lego’s signature bricks. Rhonda Tossa, a product specialist, said the project required 334,544 pieces and more than 2,000 hours of assembly from 18 workers. The lights turn on, but the bricks don’t go anywhere. Nearly all the automakers know the aim is to woo the families, the individuals to the purchase plan. 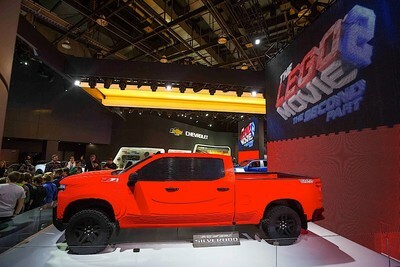 The truck made of bricks ties into the release of The Lego Movie 2 where a smaller truck appears. 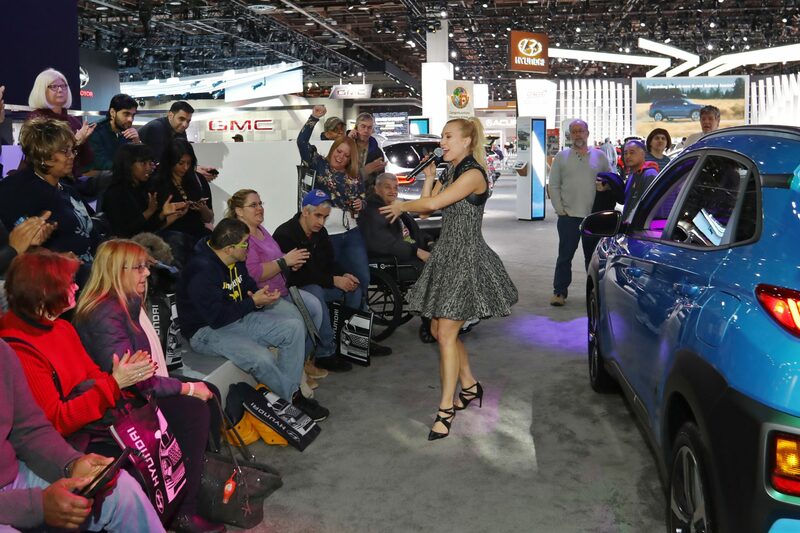 Show organizers and corporate spokespeople say two-thirds of those attending shows will buy a vehicle within the next 12 months. Honda thought about their existing customers. Lisa Schneider welcomed people to the Honda owner lounge where anyone presenting a Honda key could step back from flashing screens and loud announcements to a place with curved booths, free coffee, tea and donuts and plug-ins for smart phones. “We’re here to thank people for owning a Honda,” says Schneider who offers to charge up a journalist’s phone. People could step outside, learn more about electric vehicles and check out the latest offerings, designed to keep customers in the Honda family. 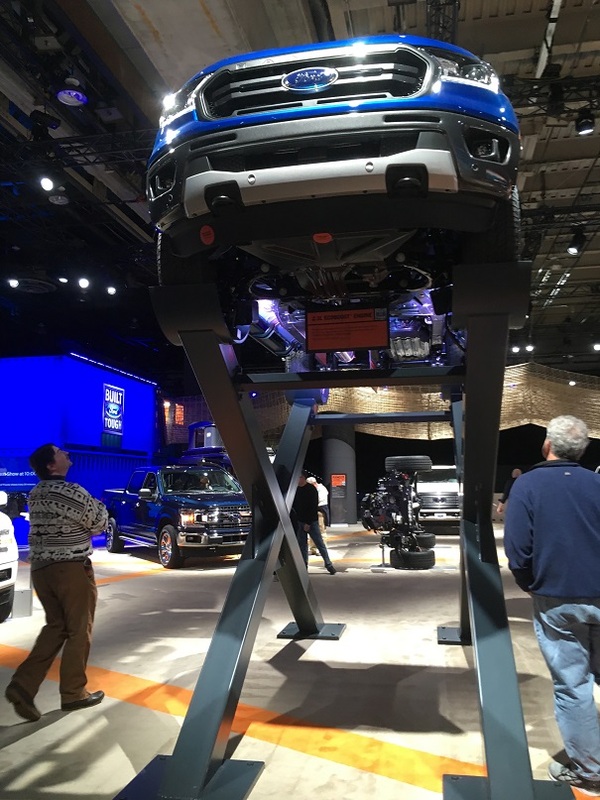 Ford has an all new booth made of steel shipping crates, both a blessing and a curse. The U.S. imports so many goods from China it has an abundance of crates. It has become one of the newest fads in building, including the Detroit Shipping Company and Beer Hall in Midtown Detroit. At the show, it casts a deep blue color that almost glows. 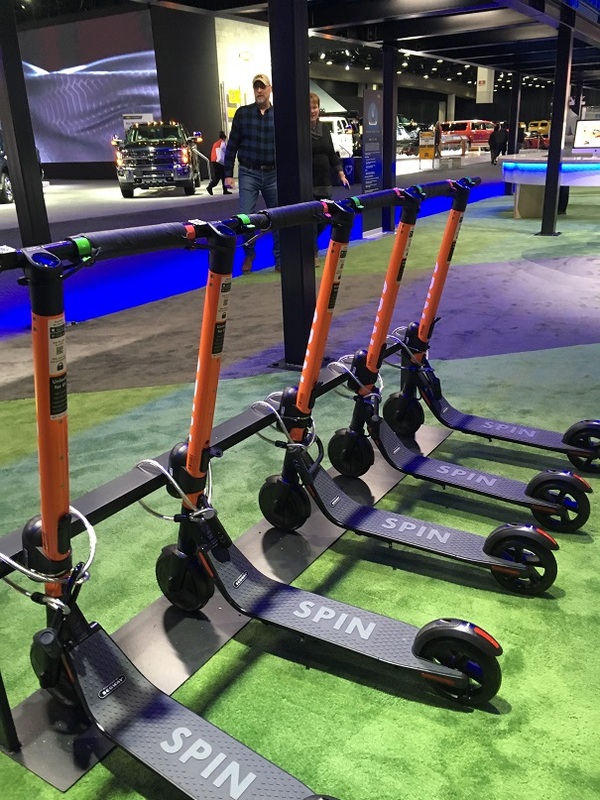 It is a backdrop for a grouping of electric scooters, the Spin, Ford purchased the San Francisco-based company in October to expand its vehicle line from cars to a variety of transportation options. One such option was the Outside Van. For an extra $38,000 above the price of a Ford Transit, owners could work with designers for a one-off, purpose-built vehicle for camping, skiing or surfing. They advertise a vehicle that enables people to enjoy freedom and connections, if they have the float for good credit. Amid all the talk, the video screens and sense around sounds, people hear loud barking. At least four tail wagers come daily with handlers from the Michigan Humane Society to a specially built enclosure with a white picket fence. Subaru extends the space so people can meet their new best friend at the show. Much of its advertising campaign is built around the Barkley family of Subaru’s, a family of Golden Retrievers and Labradors. Product specials point out the dog friendly tail gates and wide room for dog cages. All around the hall, police officers with German shepherds and Labradors keep a watchful eye on patrons who might want to create chaos during the show. No chance of stealing a vehicle because none of them have gas and must be wheeled into the display area. The pilgrimage ends, the love of automobiles lingers in the heart.